Okra is a very healthy vegetable and has so many great health properties – amongst which it has a good effect on controlling blood sugar, great for digestion and therefore good for both the bowel and kidney as far as good digestion is concerned. 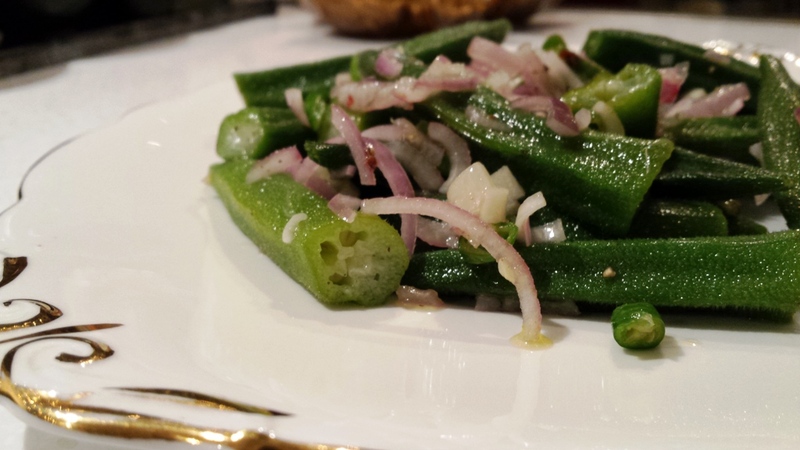 Okra is also good for the joints in preventing stiffness, so good for arthritis keeping the joints well lubricated. When I write such things I certainly have my healthcare professional’s hats on talking bowel movement, diabetes, health promotion, etc…As they say once a nurse always a nurse. I didn’t know about all the health benefits of Okra when I was growing up, my dad used to buy bags of them and we would turn our nose on them. Mum would prepare them for “gajaks” that would be sold in our bar as drinks accompaniments – in Creole we call this gajak meaning snacks or tapas. This still resounds in my mind hearing the customers asking for their plate of snack, such a buzz. Papa knew best I say that was one way of keeping his regulars happy and healthy – repeat customers for the bar. Okra is a super food with a high contents of Vitamins hence a very good antioxidant in treating and preventing infections. This is a very brief nutritional value of the very special miniature vegetable no wonder called lay’s fingers as they are so pretty. 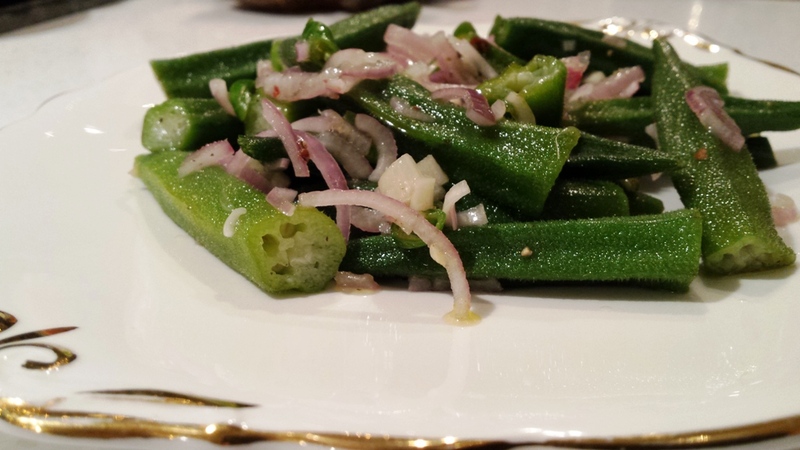 In my household Okra is very much liked in every form and any type of dish. Because of its wonderful health properties, such delicate vegetables are best consumed as fresh as possible and with very little fuss. Kept to minimal preparation in order to keep their texture & taste. So we have here one dish that is very famous in Mauritius “salad lalo” a well liked little side dish enjoyed with a slice of crusty bread under the filao tree by the sea. Picture perfect Mauritian Style. Start by preparing the vinaigrette, in a small bowl mix the sliced onion, vinegar, salt, sugar and pepper and leave to marinate. 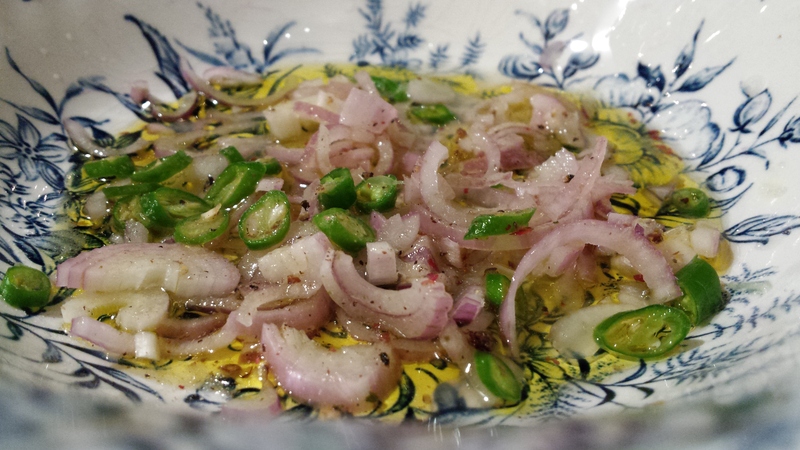 I tend to do this in advance; the more time the better you end up with a scrumptious pickled onion marinade. Test if cooked by inserting a sharp knife if soft but still with a crunch then it’s perfect. Leave aside until its cold before serving.